Brian Fleming, co-founder of Sucker Punch Productions, on his Twitter profile announced that the work on Infamous: Second Son is completed, and that the game got the Gold version. This is an exclusive for the PlayStation 4 and also the first game of the mentioned development team for that platform, which is located in Seattle and follows a new protagonist Delsin Rowe who can control the smoke. Department of Unified Protection considers him a biological terrorist, and their task is to track and capture those who possess supernatural abilities. So it will not take long for them to complicate Rowe's situation and force him to make an attempt to escape and survive. 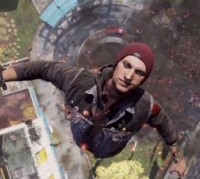 InFamous: Second Son should be released on 21st March, and the developers back in January announced that they await confirmation of whether their project is become a part of a bundle tied next to the console, although there are signs that this is very likely to happen, but we will have to wait for it a bit more.